Originally published as "Normal Design" in Art in America, December 2017. “MUSEUM-QUALITY DESIGN.” These days, you are much more likely to encounter objects evoking that phrase in a store than in an actual museum. Over the past decade, design curators have been rethinking their approach, moving away from a model originally borrowed from fine art, which had prioritized individual authorship, innovation, and aesthetics, and exploring a messier but richer landscape, the one that people in—and affected by—the profession actually inhabit. In this new paradigm, design agency is complicated. What counts as progress or beauty is hotly contested. Instead of focusing on exemplary objects, curators are wrestling with design in all its manifestations, good, bad, and indifferent. Paola Antonelli (center), Michelle Millar Fisher (right), and their team. The latest exhibition to exemplify this approach, and the one to date that does so most completely, is “Items: Is Fashion Modern?” Now on view at the Museum of Modern Art in New York, the show was organized by senior curator Paola Antonelli, with curatorial assistant Michelle Millar Fisher and a team of specialist advisers. It includes a vast range of garments, all organized according to typology. A handful are high fashion “classics” by recognizable figures such as designer Issey Miyake and Comme des Garçons founder Rei Kawakubo. Many are branded items, like Speedo bathing suits and Doc Martens boots. But throughout, the emphasis is on the anonymous and the pervasive: trappings of modern femininity, like the little black dress and red lipstick; characteristic markers of a bourgeois lifestyle, like the fanny pack and yoga pants; signifiers of subculture, such as the Kangol cap and the biker jacket; and representative examples of ethnic garb, like the sari and the dashiki. Antonelli has described “Items” as a show of the “super normal,” and indeed, nearly every visitor will be wearing variations on the very objects that are on display. It is a risky project—and what it risks is being boring. Design Real at the Serpentine Gallery, 2009. To assess the show properly, it’s helpful to first take a step back, reviewing cutting-edge design curation over the past decade. 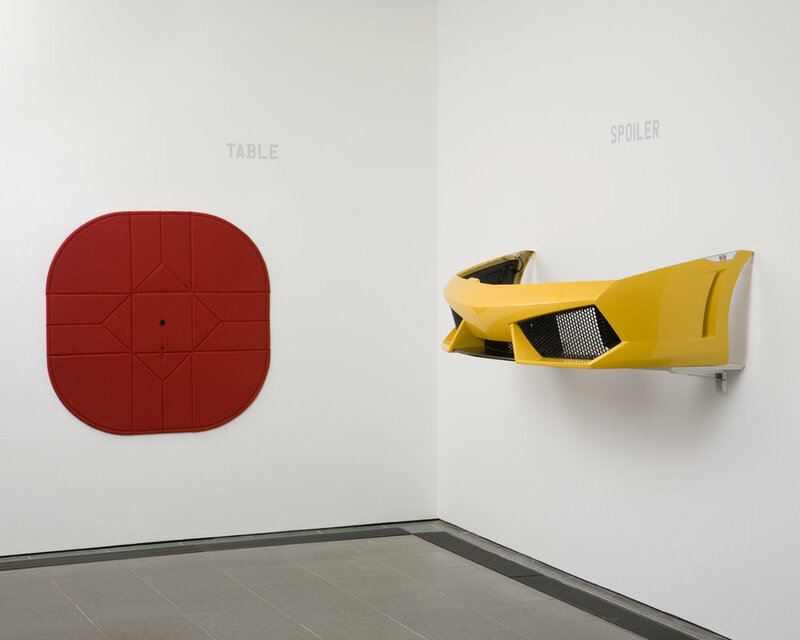 A first touchstone to consider is “Design Real,” which was presented at the Serpentine Gallery in London in 2009. For this exhibition, designer Konstantin Grcic selected a range of commercial products and boldly captioned each one with a single word so as to suggest a Platonic ideal. A welding helmet by 3M, for example, was labeled simply mask; a digitally enhanced trumpet by Yamaha, INSTRUMENT. Grcic’s approach was to render anonymous objects iconic. An associated website gave extensive information about the technical and social background for each object; what could have been a purely formalist exercise was grounded in in-depth research. Another widely publicized example of progressive design curating is the Victoria and Albert Museum’s Rapid Response Collecting initiative. This program ingeniously updates what was once the London institution’s most deliberative process: adding items to the permanent collection. True to its name, the Rapid Response team—initially led by senior curator Kieran Long and subsequently by his successor, Corinna Gardner—has moved quickly to acquire hot-button objects. When Edward Snowden’s laptop computer was impounded by the police and destroyed with a hammer (an atavistic gesture reminiscent of medieval iconoclasm), the V&A borrowed the fragments and put them on display. Following the 2013 Rana Plaza disaster in Bangladesh, in which a sweatshop factory building collapsed, killing 1,135 workers, the museum purchased a set of jeans from Primark. They had been fabricated in one of the building’s five factories just before its collapse—making the choice an unusually explicit criticism of a private company. Neon signs collected by M+ in Hong Kong. Meanwhile, in Hong Kong, M+ is taking shape: an enormous new museum that will incorporate design within a survey of visual culture. Among the first topics that the institution has taken up is neon signage, a dominant leitmotif in the Hong Kong cityscape (not to mention its cinematic representations, such as the films of Wong Kar-wai). The curators began collecting signs that would otherwise have been destroyed in the course of urban development. They also researched the history of the region’s neon industry, providing what Aric Chen, the lead design curator for M+, describes as a “post-facto rationalization” for the acquisitions. In 2014 the curatorial team launched an online exhibition devoted to the topic. The site has been wildly popular, particularly its crowdsourcing platform, which allows members of the public to post their own favorite examples. Antonelli has long been an advocate for this broader viewpoint. Her exhibition “Safe: Design Takes on Risk” (2005) was billed in the official press release as a survey of the full “spectrum of human fears and worries.” The project was sociopolitical both in the broad sense (the shadow cast by 9/11 was unmistakable) and in its detail, through the incorporation of objects like refugee shelters and equipment for clearing landmines. In contrast to such literal exemplifications of the theme, the show also included poetic objects, such as Bill Burns’s gas mask for otters—one of a series titled “Safety Gear for Small Animals”—and huggable mushroom clouds by Dunne and Raby. In “Safe,” Antonelli sought out the extremes: on the one hand, designs that have genuinely transformative social impact; on the other, nonfunctional objects that resemble artworks. Her next big project was “Design and the Elastic Mind” (2008), which focused on the incorporation of scientific research into the design process. The center of gravity was biodesign, the integration of organic science into form-giving, as seen in the work of figures such as Neri Oxman and Joris Laarman. The exhibition also attracted notice for its inclusion of process-oriented designs, such as digital interfaces, chemical modifications, and data visualization. Antonelli has pursued a parallel line of thought in shaping MoMA’s permanent collection, acquiring a diversity of nonphysical “artifacts.” The gay rights Rainbow Flag (designed by Gilbert Baker in 1978), for example, is currently hanging in the museum’s lobby; but it was acquired as an emblematic format, not a piece of fabric on a stick. The act of collection was an act of nomination, no more, no less. This is also the case with MoMA’s acquisition of graphic entities such as typefaces, the Creative Commons logo, the @ symbol, and the Google Maps pin. (Antonelli says that she has been approached by other institutions who want to borrow the @ symbol from MoMA. She tells them it’s already on their keyboard, and advises them to consider using the font American Typewriter, designed in 1974.) From a methodological point of view, Antonelli’s acquisition policy converges intriguingly with that of her curatorial colleagues who work with conceptual art. Like them, she is acquiring intellectual rather than physical property. Her most adventurous idea of this kind has so far remained unrealized: she would like to acquire a Boeing 747. Here, she has the opposite problem: too much physicality, rather than none at all. While there is a prominent precedent for collecting aircraft at MoMA—the Bell-47D1 helicopter, designed by Arthur Young in 1945, which hangs above a staircase from the museum’s third floor ceiling—there is clearly no way to fit a whole passenger plane into the building. So Antonelli instead envisions a “remote acquisition” strategy, in which an airplane still in service would be licensed by the museum. An accession number would be affixed to the plane’s exterior, and its interior reupholstered according to her specifications. This “MoMA plane” would, in effect, be a hybrid between a collection artifact and a museum branding exercise. “Items: Is Fashion Modern?” may at first seem like a retrenchment from such experiments in that it includes a profusion of physical artifacts. But in in another sense, it could be considered the most radical extension of Antonelli’s methodology yet. Design curators always face a problem their fine-art colleagues do not: why should a visitor bother looking at something in a museum when they have the same thing at home? The traditional strategy has been to feature special cases, rare and exceptional objects such as unique prototypes. Even in recent experimental design curation, exceptionalism is typically built into the program. Speculative designs are attractive to curators not just because of the ideas behind them, but also because they stand out against the commercial backdrop. In Grcic’s show at the Serpentine, quotidian object-types were sanctified—rendered supremely special—while the V&A’s Rapid Response team amasses specific secular relics of the present day: Snowden’s smashed computer; the first 3D-printed gun; not just any pussyhat but one knitted by Jayna Zweiman, cofounder of the Pussyhat Project. Even M+’s salvaged neon signs are—unlike most—unique artifacts, one-off signifiers plucked from the Hong Kong cityscape. “Items,” by contrast, is an exhibition of mostly generic, unremarkable things: “not prototypes,” Antonelli says, “but archetypes.” The show’s premise and subtitle echo those of Bernard Rudofsky’s 1944 exhibition for MoMA, “Are Clothes Modern?,” which surveyed historic apparel in an anthropological mode. “Items” reincarnates this singular precedent, an outlier in the institution’s exhibition history. It is a story without heroes. Instead of Malevich’s Black Square, Antonelli gives us a white T-shirt. Yet in a strange and ingenious reversal, the show is possessed of a remarkable intensity and urgency. Even more than her previous projects, it reveals our design landscape as thoroughly contested, infused with conflicts about gender, ethnicity, class, and power. There are plenty of examples of haute couture in the show, as well as speculative designs commissioned for the occasion—a dress in spider silk by Stella McCartney, a pair of boots designed for a mission to Mars. But while eye-catching and diverting, these more outlandish contributions to the exhibition are actually its least provocative elements. Each “item” is accompanied by a brief genealogy. The label for a cherry-red Champion hoodie, for example, traces the design’s origins to 1930s athletic wear, then details its appropriation in the hip-hop and skater scenes of the 1970s. Then it’s on to the present. Trayvon Martin was shot wearing a garment like this, while Mark Zuckerberg employs it as “a symbol of measured defiance of business dress codes.” When it comes to cultural implication, just this one garment speaks volumes. And so on through the rest of the exhibition, which delves into one stereotype after another, to fascinating (and sometimes infuriating) effect. Even the show’s credit lines play a key role. The range of sourcing is extremely wide and obviously tactical. Though there are some museum loans, many garments are borrowed from manufacturers’ archives—not just any polo shirt, but a 1962 example from Lacoste; not just any jeans, but a well-worn pair from 1947, lent by Levi Strauss. The salwar kameez on display was purchased in Pakistan. The fur coat is borrowed from PETA. It is often said that we live in an “attention economy,” meaning that value is increasingly created by directing the gaze of the public. This is what curators do all the time, of course, but only rarely do they manage to turn the gaze inward. Antonelli and her team have managed to do just this. The exhibition shows us what we already know, but in a harsh, raking, and ultimately clarifying light. It aims, in her words, for “transparency and systemic honesty.” “Items” is, then, anything but boring. In fact, it prompts a counterintuitive thought: if we seek a pathway for museums to challenge their audiences, at a time when avant-garde gestures are likely to be met with jaded acceptance, perhaps design curators are actually in a better position than their colleagues in fine art. Design is the matrix we all inhabit, all the time. Yet museums are only now beginning to explore that reality. It will be interesting to see how deep the rabbit hole goes.